Artist Katie Adams will travel just beyond her backyard to sell her paintings at the Moss Rock Festival on Nov. 3 and 4. Journal photo by Ingrid Howard. It took a while for Hoover native Katie Adams to find a career she loved. She graduated with a degree in finance, but she hated her job at an insurance company so much that she waited tables for two years until she could find something different. She took a drawing class from Svetlana Belotserkovskaya, a Russian-born artist who teaches at Art-Zone in Hoover. It was there that Adams realized she could draw. She started out painting portraits of people, but she decided it was too technical. She liked painting pet portraits, but she didn’t like commissioned work. Now she paints animals at her home in the Moss Rock Preserve and sells them at festivals. She said she has finally found something she really likes. On Nov. 3 and 4, she will travel just beyond her backyard to sell her paintings at the Moss Rock Festival. Adams said she loves selling at festivals and having the chance to meet her customers face-to-face. Sometimes, her customers teach her things. 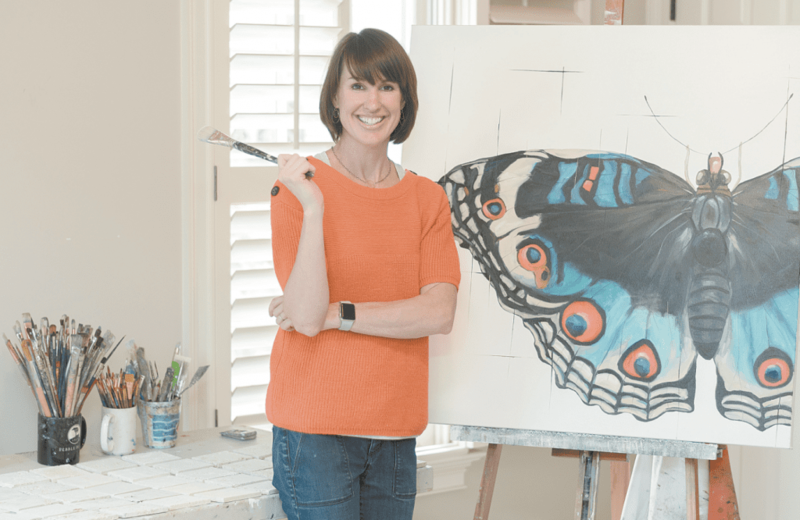 She said one visitor at a Bluff Park festival was impressed by a painting she made of a butterfly, and they were able to learn from each other about butterflies. Adams already is getting prepared for the festival. Rows and rows of drink coasters line the tables in her upstairs studio, each one with a small version of one of her paintings printed on it. On her canvas sits a large oil painting of a butterfly. The more she paints her subjects, the easier it gets. Adams said that once the canvas was prepped, it only took her about 3½ hours to complete the butterfly painting. Instead of leaving the background of the canvas white, Adams said she added subtle grid lines to create motion. “In a lot of the other pieces, I’ve got a splatter or a smear or a scrape, and it’s all to create motion so they don’t look so stagnant,” she said. Additionally, Adams positioned the butterfly off-center to make it a more interesting composition. Adams will sell this butterfly painting and others like it at the Moss Rock Festival. For more information and to buy tickets to the event, visit mossrockfestival.com.